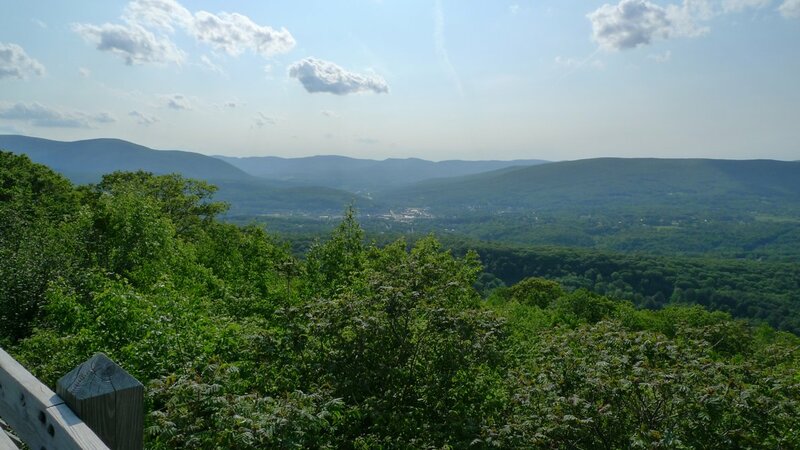 The Berkshires of Western Massachusetts offer endless route possibilities in mountainous terrain. Presented here are three routes I've enjoyed. 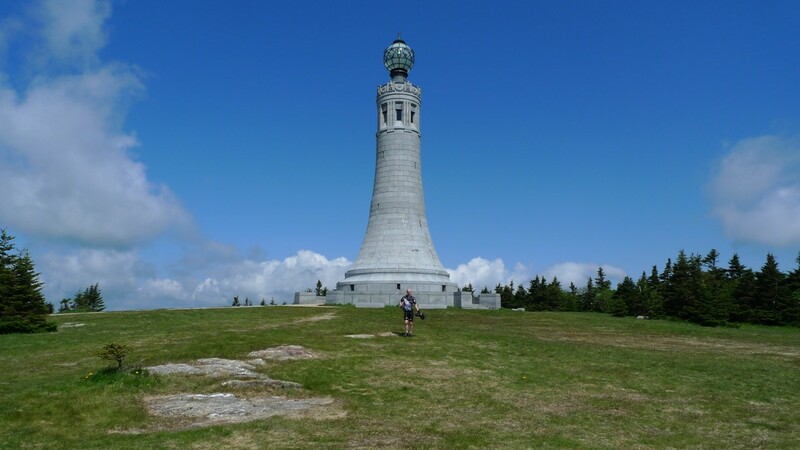 They all include summiting the high point of the state, Mt Greylock. The shortest route crosses over the Taconic Crest into New York and again coming back into Massachusetts. The majority of these routes utilize very low traffic roads, but they all pass through busy North Adams to access Mt Greylock. A nice loop I’ve done multiple times straddles the border of MA/NY, which roughly lies on the Taconic Crest mountain range (great mountain biking by the way). The ride starts in North Adams, climbs over Mt. Greylock and continues west into NY, coming back over Petersburg Pass. There’s a third climb along the way adding hundreds of additional feet of climbing. Altogether, the ride runs about 62 miles and about 6000 feet of climbing. The details. Park at Heritage State Park in N. Adams, MA. Climb Mt Greylock from north by taking short Furnace St to Reservoir Rd, then this to entrance of state park. Now on Notch Rd, you will be climbing persistently near double-digit grades for the next few miles. Take a left at the junction near the summit to access the peak. Be sure to walk over beyond the monument to take in the birds-eye view of Adams below. Coming back down from the peak, bear left at the junction to descend Greylock on the south side. Take a right on Rt 7. Take a left almost right away on Bailey Rd. You will climb almost 500 feet on this road at a moderately steep grade. Turn left on Brodie Mtn Rd, and left again on Rt 43. Enjoy the brief descent. Continue over the state line into NY. There’s a conveniently placed gas station/grocery store/deli on Rt 43 just before you get to Rt 22 in case you need to refuel. Turn right on Rt 22, heading north for what will seem like forever. When you get to Petersburg, turn right on Rt 2. After a small descent, you will begin climbing in earnest up to Petersburg Pass. The descent down the other side back into Williamstown, MA feels so good. Stay on Rt 2 back to North Adams to your car. This is a nice introductory loop to riding in the Berkshires. A bit trafficy on Rt 22 in NY and on Rt 2 through Williamstown and North Adams, but the rest of the ride makes it worth while. The other two routes listed below nearly double the amount of climbing involved. Don't let the title of this ride fool you. It is hard. 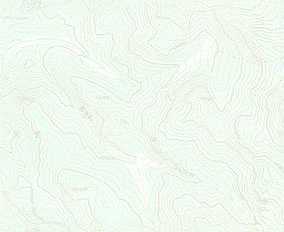 In the first 15 miles, you will climb about 3300ft, most of it at very steep grades. By the time you reach the Mt. Greylock summit in 30 miles, you will have climbed over 6000ft. 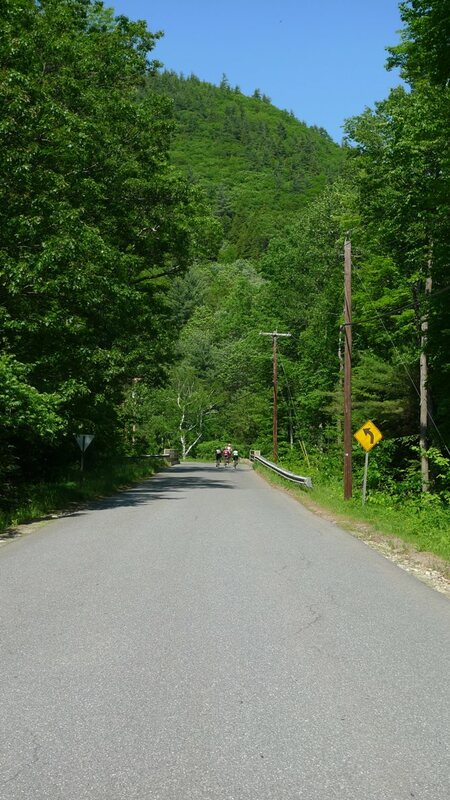 The climbing is front loaded in this ride and hits two of the most notable climbs in Massachusetts, the biggest vertical and the steepest mile. There are many places at which you can start this ride. I show the ride starting at the Deerfield River access parking lot on Rt 2 in Charlemont. You could start at many places in Adams or North Adams. There is a public parking area on the rail trail in Adams on Harmony St too. You can see both of these lots in satellite view. Starting from Charlemont, you get only a two mile warm-up before encountering the first climb. This is Zoar Rd. It follows a stream until bearing left on Brittingham Hill Rd. This will climb earnestly at double digit grades. The high point of this first climb doesn't come for a while yet, not until Monroe Hill Rd. Monroe Hill Rd. is a white knuckle speedfest descent. Watch the corners. The one near the bottom is sharper than it looks. You will cross over the Deerfield River and shortly begin the "Meanest Mile in Massachusetts." This is Kingsley Hill Rd. The grade hovers between 18-24% most of the way up. Think you can clean it without special gearing? The road is in pretty rough shape, but it works fine for climbing. Kingsley Hill Rd is only the first installment of this climb. Tilda Hill Rd is the second. Never very steep, but you will gain another 700ft in about 2 miles. When I last rode through here, I poked into the clouds and couldn't see more than 100ft ahead of me. Hitting a moose at 40mph would ruin your ride. Once on Rt 2, there is a little blip of a climb before beginning the big plummet to North Adams. Rt 2 is busy with minimal or no shoulders in some parts. I would never recommend climbing this section of Rt 2. But descending, you will pretty much stay with the traffic most of the way down. Watch out for the hair pin switchback shortly after beginning the descent. The Mt Greylock climb is next. 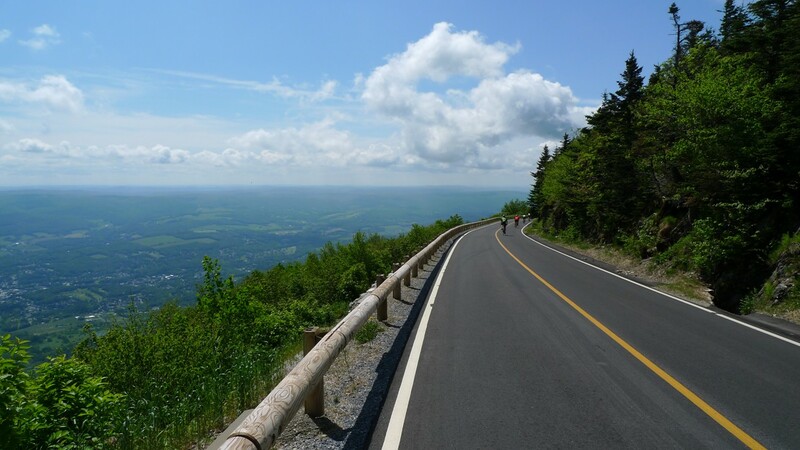 The Berkshires Shorty route follows the same course as the Mt Greylock Hillclimb Time Trial. The steepest part of the climb is actually right at the beginning in town on Reservoir Rd. The grade levels off in a few spots and descends briefly too. Once on Notch Rd, you are in for a haul of a climb. The first few miles are fairly steep, but the climb becomes less and less strenuous as you near the summit. Take a left at the stop sign to knock off the last 0.5mi to the high point of Massachusetts. The view from the rock outcropping by the monument is splendid. Be sure you walk over to it. You gain a birds eye view of Adams, where you will be shortly. Monument at summit of Mt Greylock. Be sure to check out view from ledge. June 2009. Descending Mt Greylock to the south, you will be on shouldered Rt 7 for a bit. There used to be a dirt road cut-through, Quarry Rd, but the last time I rode through here it was closed and not suitable for skinny road tires. So bang a left on Rt 7, then in a couple miles take a left on Summer St, climbing a brief, steep hill. Just over the top, look for Old Cheshire Rd to the left. This will roll and descend gently, change names, and eventually drop out on Rt 8 just south of Adams. Head north on Rt 8 just a couple blocks and look for sign for rail trail. It is much prefered to riding busy Rt 8. The rail trail is accessed from Church St. Head north on it for several miles, initially distanced from the busy auto route. In the center of Adams, the rail trail will cross Hoosac St. This is your final, major climb. It gets steep in about a mile and stays that way all the way up. In the summer, this climb can be very hot. Once you reach the height of land, where hopefully it is a bit cooler, the route rolls some. You'll eventually pop out on Rt 116, which you will bear left onto. You'll have to refer to the map above to follow the many road name changes for the descent back to the car. You will start on Loop Rd. Expect to encounter several more short climbs before reaching the final descent to Rt 2. The pavement on the lower portion of Black Brook Rd is in pretty rough shape. Watch your speed around the corners. There are some carbon wheel destroying frost heaves and busted up asphalt sections. At Rt 2, turn right and enjoy the last few miles of gradual down hill back to the car. For those seeking full Berkshires treatment, the Berkshires Boondoggle extends the above ride by another 20 miles with a big climb, the infamous East Hawley Rd. Follow the description above. Instead of following Rt 2 all the way back to the car (assuming you started at the river access lot in Charlemont), bear right on Tower Rd. This will join Rt 8A/West Hawley Rd along the river. Just past the bridge over the river, East Hawley Rd begins climbing in earnest in short order. This climb separates the men from the boys in the Tour of the Hilltowns road race. After the climb levels off, the road changes to Plainfield Rd, then again to North St. Bear left on Union. The last little bit of Union dropping down to Rt 116 may still be gravel. Take a right on Rt 116 and climb one last roller before taking Rt 8A all the way down back to the cars. Take a left at the tee with Tower Rd to pick up Rt 2 right at the parking lot just over the bridge. Chances are, when you get down to Rt 2 after the Hoosac Rd climb, you may be quite parched and out of water. The temptation would be to just bag this extension to the ride. But there is food and water nearby in Charlemont. When we rode this loop on a Saturday in June, there was a tiny beer store just over the Rt 8A bridge that was open and had basic replenishments for cyclists. If you prefer a little more selection, you will find a country store in the village of Charlemont not more than a mile east on Rt 2. In 2009, I did a slight variant of this ride with a strong group of climbers. It took us nearly 7hrs to complete the ride. It may fall just shy of being an honest century ride, but all of the 10,000+ feet of climbing is very steep.